Human Urethra Epithelial Cells (HUEpC) provide a good system for studies of urethral epithelial cells under normal and pathological conditions. To meet various needs for research and development in human urethral epithelial cells, Cell Applications, Inc. has isolated and purified Human Urethra Epithelial Cells (HUEpC) to create a more realistic in vitro model. Cell Applications, Inc. In addition to functioning as physical barriers against microbes, the urethral epithelial lining participates in the first line of host defense by producing a variety of proinflammatory mediators when exposed to microbes and microbial agents. (Click to Enlarge) Top: Human Urethra Epithelial Cells: HUEpC (L) HUEpC immunolabeled with an anti-CK19 antibody (R). 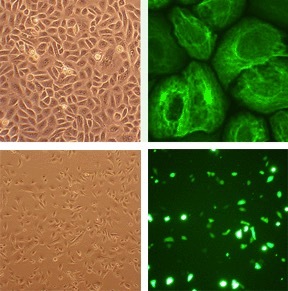 Bottom: HUEpC (L) transfected with GFP plasmid DNA using the Cytofect™ Epithelial Cell Transfection Kit (R).